After shopping at Save On Foods in North Vancouver this evening, I remembered that my friend was talking about a cozy park adjacent to Light House Park. It was 15 minutes later when I was parking my car at the entrance of the park named Kloochman Park. As most of this area is private property, it was a little bit hard to access the cost. After 20 minute hiking with some unexpected, steep, up-and-downs, finally I arrived at a spectacular spot on a huge rock. 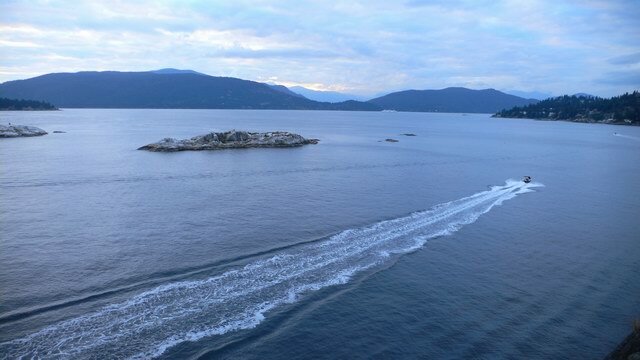 It seemed to be a perfect camping site not only with a great sea view of Bowen Island and Vancouver Island, but also with a flat rock surface. If you were a businessman in Vancouver and you had a tent and sleeping bag, you could visit this place after the work, enjoy perfect camping here, and then go back to your work in the morning. What an enjoyable city Vancouver is! I'm impressed by this photo. 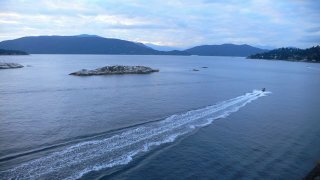 How beautiful place North Vancouver is. Camping and go back to work next morning. How nice. Finally, some clear skies! Alan Jones and I went to Hope Slide last night, to try to catch some galaxies that we can't see from town.Seeing wasn't great, but fttlunareoy that doesn't matter so much for fuzzy stuff. The skies were certainly nice and dark. We couldn't see every galaxy that Uranometria lists in Leo, Virgo and Coma Berenices, but pretty much every NGC numbered galaxy that we looked for was visible.We left Coquitlam about 7:30pm on a Saturday night and got to the site around 9:15. That gave us enough time to set up and let the scopes cool while it got dark. Alan brought his sweet little portable 12 dob and I had my 15 , plus my 120mm refractor. The refractor didn't get used much. It was quite windy, so I left the shroud off my dob. It still blew around from time to time if I was away from the scope, but didn't shake too badly while observing.For eyepieces, I mostly used a 13mm Ethos in the 15 , occasionally switching to a 35mm Panoptic when I wanted a wider field of view. Contrast was much better with the 13mm however, so the 35mm didn't see much use. The focal length of the scope is 1600mm, so those eyepieces gave magnifications of 120x and 45x, respectively. I'm not sure what eyepieces Alan was using; I remember a 17mm Ethos and 22mm Nagler, but that might not be right. During twilight, we played around looking at Mars and Saturn. Seeing was poor: couldn't see any polar caps or surface details on Mars and the rings of Saturn often seemed to change shape while we watched. As it got darker, the seeing steadied a bit and we could clearly see the gap between the rings and Saturn. The Cassini division never came clear, but in the 15 we could see Titan, Tethys, Dione and Rhea near the planet, but not Enceladus which Starry Night tells me was just across the ring plane from Rhea. Iapetus was wandering quite far from the ring plane; if we saw it, I certainly didn't recognize it as a moon. In the 120mm refractor, I could barely make out Titan (a rather disappointing performance). In the 12 , we saw Titan, Tethys and Dione, but I couldn't make out Rhea.We shifted to looking at galaxies as it got darker. Leo was prowling just above the mountain to the west, so we started there to see what we could before it set. I always seem to struggle to find M95, M96 and M105. Last night it was because I was under the false impression that I should be able to see all three in the same eyepiece field of view, when in fact they are too far apart. At first I mistook M105 and its two companions (NGC 3384 and 3389) for the entire group. Alan eventually figured out that M95 was just above Mars; from there it was easy to jump to the others. Nudging the scope up from M105, it was easy to see NGC3391 and then west to NGC 3367, 3377&3377A( these two were nearly stellar, but with enough surrounding fuzziness to be sure they were galaxies) and NGC3357. I tried looking for 3419 and 3419A on the other side of 3391, but didn't manage to spot them. There are other NGC galaxies in the area, but we shifted our attention to the Leo Triplet under the Lion's tail.The triplet of M65, M66 and NGC3628, unlike the Leo I group, fits nicely within the field of view of the Ethos 13mm on the 15 scope. The edge-on spiral NGC3628 contrasts nicely with the two face-on spirals. NGC3695 is another pretty edge-on spiral nearby, but I can't recall whether we saw it last night. I think I looked for it briefly but gave up before finding it, as Leo was setting into turbulent air near the top of the nearby mountain and I wanted to move on to the Virgo cluster before it did the same.For me, the easiest part of the Virgo cluster to find is always the triangle made by M84, M86 and NGC4388, with 4387 in its centre. Uranometria shows I3303 along one side of the triangle, but I couldn't see it last night. Presumably it requires better seeing, better transparency or a larger scope. Last year on my springtime visit to Hope Slide, I went from M84 etc. along Markarian's chain. For whatever reason, last night I instead poked around looking at random galaxies, while Alan with his 12 scope went along Markarian's chain, following it along to M88 then back down to M91 and M87. He then wandered a broad path until he found a beautiful edge-on spiral, which turned out to be M98. My memory isn't what I'd like it to be: I couldn't recall which of the Virgo cluster galaxies has the jet that's supposedly visible in amateur scopes. M87 has the jet, but for some reason I thought it was in M60 so we went there next. I'm glad we did. No sign of the jet of course, but M60 is a pretty double with NGC4647 and there is lots of other nice stuff in the area. Our view wasn't quite as good as this photo, but the brighter galaxies were distinctly visible.By this time, the top of Virgo was also sinking into the turbulence just above the mountain ridge. We moved up the sky to Coma Berenices, but first Alan took a break and went to look at M51, the Whirlpool. The spiral structure of the main galaxy was clearly visible in the 12 scope, with hints of structure in the smaller galaxy. I couldn't quite make out the bridge between the two galaxies. The view wasn't much different in the 15 , though it improved a lot when I redid the collimation: my primary mirror has an unfortunate tendency to shift back and forth as I swing the scope around.Back in Coma Berenices, I completely failed to find the globular clusters M53 and NGC5053. I think I was looking in the right place, but I was getting tired and may have been in a different part of the sky. I similarly failed to find M64. Frustrated, I wandered aimlessly through the constellation, looking at but not identifying galaxies, until I stumbled on NGC4565, the Needle Galaxy. I didn't know what it was, but I was caught by how long and thin it was, by the clearly visible central bulge and by the hint of a dust lane. It took me quite awhile looking at the pocket sky atlas to identify the galaxy. Uranometria wasn't much help, because chart 72 is so full of stuff that I couldn't match the chart to what I was seeing. Looking at the photos on the wikipedia page, I have no doubt that it was NGC4565. From there I was able to find the general location of the centre of the Coma Cluster, but I was too tired to try to figure out which was which.Overloaded, we moved to easier and more familiar terrain. I looked at the Ring nebula and the Veil. The ring was nice and bright, but with the relatively poor seeing I didn't bother trying to put on enough magnification to try to see the central star. The Veil didn't look like much without a filter: I think there was some haze in the air to the east. Alan told me he had a nice view of the Dumbbell and some other stuff I don't recall. Sometime in the evening he found M81 and M83: the dust lanes in M82 were perhaps barely visible with a bit of imagination: a good view but not as good as at last year's Merritt star quest.Turning to the other side of the sky, I poked around Ursa Major for a bit. M101 was nice, with lots of structure, but I don't remember the layout well enough to know whether any hint of last summer's supernova is still visible. I presume not. The nearby NGC galaxies were easily seen: I didn't try to identify the NGC objects that are details of the galaxy itself. I moved over to Phecda and M109, then looked at galaxies in and near the back of the dipper's bowl, without trying to identify them. There are many. I looked at a few other galaxies in the area, then we decided to call it a night as we were getting tired and still had to drive home.We started to see moonlight behind the mountain to the east as we were packing up. By the time we got to Coquitlam, dawn was lighting up the north-eastern sky.In all, a very pleasant way to spend a night. Even if quite a few mosquitoes did join us in the car for the ride home.